The Dan Holt Team are experts when it comes to buying and selling homes in Springfield. Knowing the communities and neighborhoods is key to finding you the right home. The Dan Holt Team has made it our goal to make home buying and selling less stressful. By guiding our clients through each step of the process and making sure they are informed, we ensure that you are more likely to find a home that is a perfect fit for your needs. Knowing which part of Springfield and the surrounding areas you would like to live in can give your realtor much better chance of matching you with the right home. 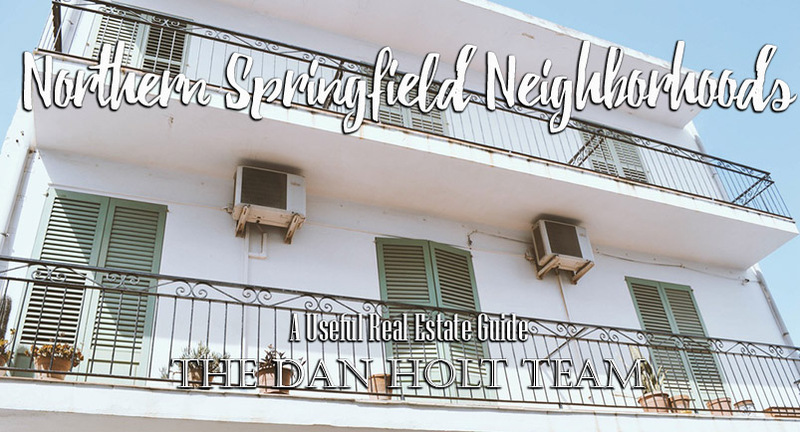 Here, The Dan Holt Team offers our real estate guide on some of the notable neighborhoods in Northern Springfield. Stonehinge is a subdivision in West Springfield with close access to Highway 160, and Sunshine street. The neighborhood is in close access to the Rutledge-Wilson Farm Park, Wilson’s Creek Greenway Trails and Creek, restaurants, and Walmart shopping centers. Stonehinge has walking trails, a pool, and recreation areas within the entrance for residents. Children who live in Stonehinge will attend Willard Schools. Looking to learn more about Stonehinge? The Dan Holt Team has the experts to guide you through the process. Springlawn Park is a subdivision in North Springfield with nearby access to highway I-44. The neighborhood is near the Dickerson Park Zoo, Ozarks Empire Fairgrounds, Lowe’s, and Walmart shopping centers. Springlawn Park has walking trails, a pool, and recreation areas within the entrance for residents. Children who live in Springlawn Park will be able to attend the following Springfield schools: Hillcrest High School, Pleasant View Middle School, and Truman Elementary School. Huntington Park/Pointe is a subdivision in North Springfield located near highway I-44. The neighborhood is close to the Ozark Empire Fairgrounds, the Dickerson Park Zoo, Lowe’s, and Walmart shopping centers. The majority of the homes in the neighborhood have fenced backyards, perfect for children or pets. Children who live in Huntington Park/Pointe can attend the following Springfield schools: Hillcrest High School, Pleasant View Middle School, and Truman Elementary School. Crown Meadow is a subdivision in North Springfield with close access to highway I-44. The neighborhood is within easy distance of the Springfield-Branson Airport, the Dickerson Park Zoo, Ozarks Empire Fairgrounds, Lowes, and Walmart shopping centers. If you are looking to raise a family Crown Meadows could be perfect for you. Children who live in Crown Meadow will attend these Springfield schools: Hillcrest High School, Reed Middle School, and Williams Elementary School. If Northern Springfield sounds like an area you would be interested in learning more about, the Dan Holt Team can guide you through the homebuying process. Contact us today to speak with one of our expert representatives. Dan Holt and his team will get you started on the path to your dream home.